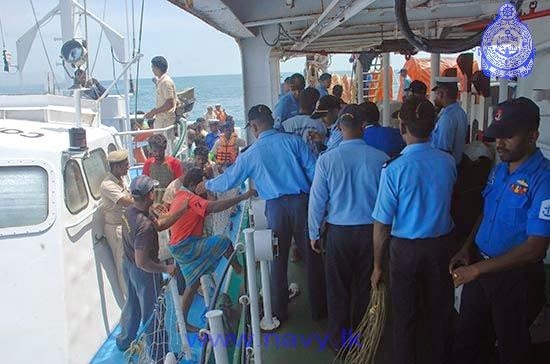 Sri Lanka Navy assisted the repatriation of 94 Indian fishermen released from Sri Lankan custody on 16th August 2014. Seventy-four (74) fishermen were handed over to the Indian Coast Guard Ship "Sarang" in the seas off KKS at the International Maritime Boundary Line and another twenty (20) fishermen were handed over to the Indian Coast Guard Ship "Rajtharang" in the seas off Thalai-mannar at the International Maritime Boundary Line. Naval patrol craft attached to Northern and North Central Naval Commands were deployed for the humanitarian mission. Sri Lanka Coast Guard also rendered assistance. The release was made on the instructions of His Excellency the President as a gesture of goodwill on the occasion of India's Independent Day celebrations.